Alex looks in on Izzie, who is fast asleep in her hospital room. In Cristina's bedroom, Cristina and Owen are finally spending nights with each other, relaxing by watching videos of surgeries (naturally). Cristina falls asleep, so Owen turns the TV off and shuts off the lights. He dozes off, the screen goes dark and the next thing we know, Owen is choking Cristina. Violently choking her. It's not a dream. She struggles but can't free herself. Callie walks through the door to see if everything is okay, and intervenes to stop him. Callie calls Meredith. Cristina assures them that she is alright, and that Owen did it by accident in the middle of a nightmare. Owen, sobbing, asks if she is alright. She hugs him and says that everything is fine. The next morning, Meredith is back at her house. She is making coffee when Derek comes home. He's still unshaven and unshowered. Without saying a word, he opens the ring box and presents the diamond ring to her. She says, “No, not like this.” She reminds him that it's his first day back and it's all about Izzie. He has to save Izzie. At work, Cristina is wearing a turtleneck to cover up her neck bruises. She doesn't want Cristina to cover for her boyfriend because neither of them is okay. 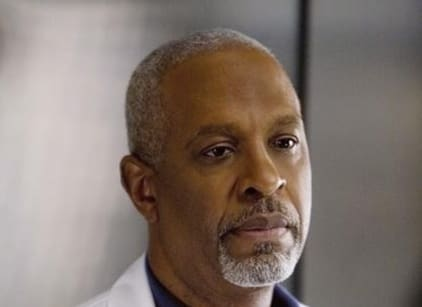 George is upset that Izzie didn't tell him about her illness. He doesn't want to think about it, so he asks Callie if he can be on ortho today in order to avoid thinking about Izzie. Bailey greets the residents before they go into Izzie's room. She reminds them all that Izzie needs them to be friends and not doctors now. The oncologist, Dr. Swender, is overseeing all of Izzie's treatment and she tells Derek, Richard and Bailey that everything they do needs to go through Swender first. Izzie knits and reminds them that they have other patients and tells them to go save lives. Derek asks Alex, as Izzie's boyfriend, if he has any questions before her brain surgery today. Alex doesn't say much. Later, Richard awkwardly asks Alex whether he wants to produce a sperm sample because they are harvesting Izzie's eggs prior to radiation. Mark's patient is an aging woman unlikely to make it through the day. But her nephews and niece are anxious to catch flights and can't be bothered to stick around until she dies. Dr. Swender wants to tell Izzie some bad news, but Cristina knows telling a patient bad news before surgery increases the chances of complications. Meredith and Callie tun interference when Owen approaches Cristina, preventing him from getting anywhere near her. Owen and Derek go to the roof of the hospital to receive a head trauma patient who was helicoptered in. The sound of the helicopter makes Owen freeze up for a moment until Derek snaps him out of it. Cristina wants to complain about Dr. Swender to Meredith, but Mer wants to discuss Owen instead. Cristina says that Owen is wounded, and it's no different than if he came home from Iraq without an arm or a leg. Outside the hospital, Derek reminds Owen that PTSD is a real injury that produces real physiological changes, but it can also be healed. Richard knocks on the door of the room in which Alex is supposed to be ... well, you know. Alex yells at him to go away, so Meredith takes that opportunity to come in and talk. Alex says he should have seen those signs, that he's not a very good doctor, and that he's sad that things have turned out this way. What a powerful scene. Cristina finds Owen in the basement with the secret steam vent. He tells her to stay away from him because he almost killed her. She says gently that she knows her limits and knows how much she can handle. Bailey comes to check on Izzie. While checking on the monitors, she quizzes Izzie on medical stuff so that she won't get rusty. Stressed out, Derek spends a considerable amount of time in the practice lab going over the surgery he has to perform on Izzie. Alex deposits his cup of sperm on the table right next to where Richard is eating lunch. Richard gets grossed out, and reminds him that he needs to actually talk to Izzie about procreating at some point. The residents eat lunch in the cafeteria, but none of them have checked in on Izzie. Bailey goes in to check on Izzie again and is surprised to see that Izzie has finished the scarf she was knitting. She had a lot of time to since no friends came to visit. Callie confesses to Arizona that she wanted Izzie to die while she was with George. Callie feels guilty that she wished death upon someone, but Arizona reminds her that she isn't praying for Izzie's death anymore. Alex's old patient starts coding again, and her relatives kind of roll their eyes, wondering if this is the time she is actually going to die. Alex throws them out, charges up the paddles and revives her. The old lady regains consciousness and hears Alex tell Lexie not to let her heartless nephews and niece in the room again. But the old lady says no. They are impatient for her death, but they are always by her side. They are her people, and having people is better than having no people. Alex runs to Izzie's room, but she has already been taken to the OR. Before Derek goes to operate on Izzie, he runs out to tell Meredith that he's not ready to operate because he needs her to say yes. Whatever happens in that operating room today, he needs to know he still has Meredith afterwards. Meredith says no, but that she loves him and he better go back in there and operate because she knows he can do it. On the table, Izzie tells Bailey that the scarf she was making was for her. Derek says it's a beautiful day to save lives. George tells Callie he doesn't want to talk about it because he's mad that Izzie kept her condition from him, and when she needed help she turned to Cristina, of all people. Lexie is all by herself with the old lady and can't revive her when the old lady starts coding. She tells the impatient relatives that their aunt is finally dead. Now that the old woman is actually dead, they get sad and decide to stay a bit longer to pay their respects. Swender crashes Izzie's surgery, second-guessing Derek's every move. He finally gets his groove back and tells Swender that he knows what he's doing. In the meantime the residents and interns wait anxiously. Bailey comes out to tell them good news and bad news. The good news is that Derek was able to take out all of the tumor from her brain. The bad news is that they were all terrible friends to Izzie today. After surgery, Derek whines to Richard that Meredith turned down his propsal twice. Richard tells Derek that it was Meredith's idea to have Izzie's eggs harvested because she was confident Derek would save her. Cristina approaches Owen in an on-call room to tell him that Izzie's surgery went well. Owen asks to hold Cristina. They fall down on the bed and start making love. They consummate their relationship just when they realize that they can't be together. As they lie together in each other's arms, Cristina whispers she is afraid to fall asleep. She doesn't want a relationship with someone she is afraid of in this way. Meredith tries to walk into an empty elevator, but Richard stands in front of the door, blocking her way for some reason. Meredith presses the button again, and the other one opens. Derek is in the elevator. He has plastered the walls of the elevator with MRI scans of all of the successful surgeries they have had together. He tells her that she doesn't freeze. She's seen the worst and been through the worst, but that is how she has the strength to help everyone. Her dark and twistiness is a virtue, not a flaw. He doesn't get down on one knee. He doesn't ask any questions. He simply says that he loves her and wants to spend the rest of his life with her. She says the same. There is no real celebration of their engagement, though. Instead Meredith goes over to Cristina's where she learns that she broke up with Owen. She climbs into bed with Cristina and they lay there quietly. Alex climbs into Izzie's hospital and holds her hand.